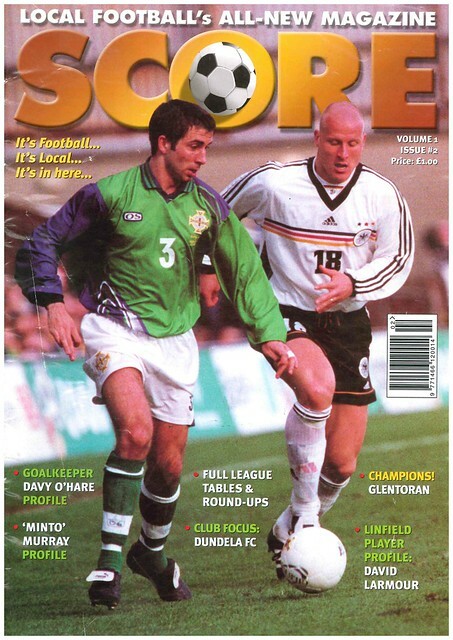 This week, we go back to the turn of the century, and the short lived Irish League magazine Score, with Kevin Horlock being the cover star, in action for Northern Ireland against Germany in a recent European Championship Qualifier. 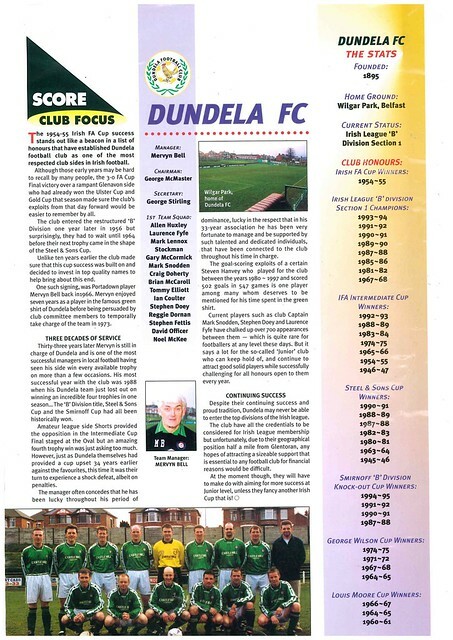 As you open the magazine, there is a full page profile of Dundela. 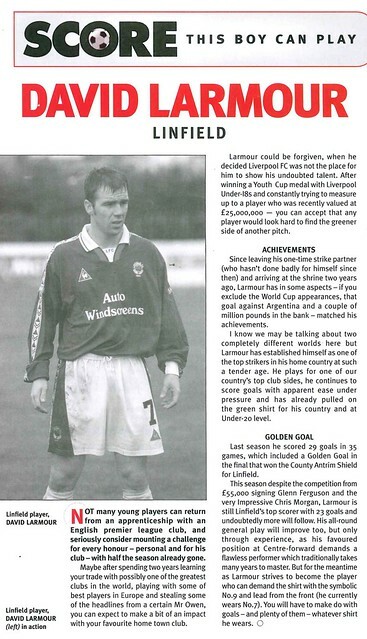 David Larmour of Linfield gets a profile, across the page of a profile of Davy O’Hare. 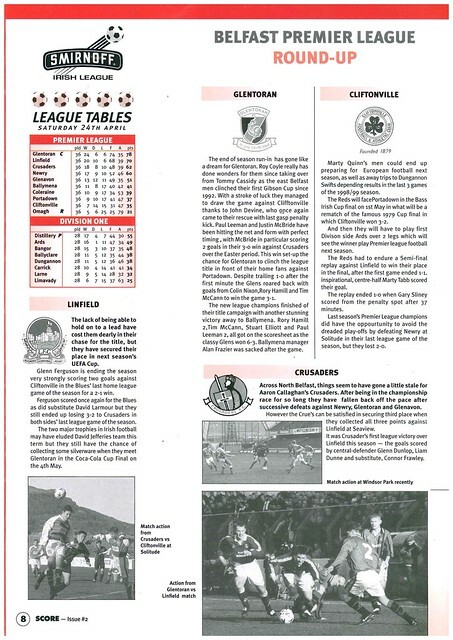 It is expected that O’Hare will spend the summer of 1999 choosing between signing for Linfield (Neil Inglis getting binned after an error in the Irish Cup Semi-Final) or Glentoran (Wayne Russell possibly signing for Bohemians). Paul Leeman takes a quiz on Irish League football, only managing a score of 8 out of 10, getting a question wrong on when Glentoran last won the league. 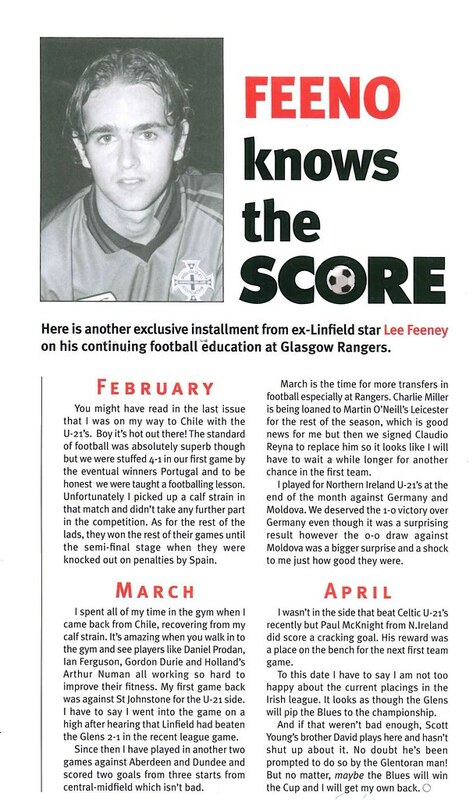 Lee Feeney writes a diary on his time in Glasgow, having just signed for Rangers. One of team-mates is Scott Young’s brother, with whom he has Irish League banter. 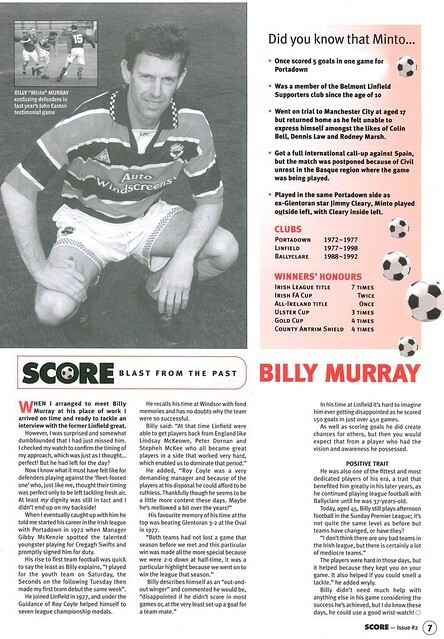 Another ex Linfield player profiled is Billy Murray, who had come out of retirement in his 40s to play in John Easton’s Testimonial, and looks back on his career, mostly spent with Linfield. 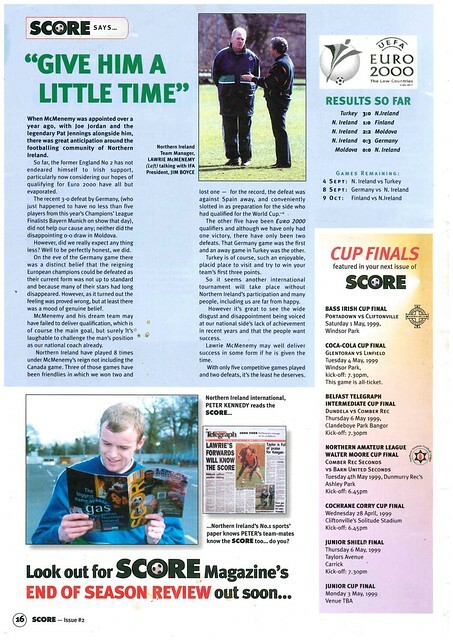 The magazine is Belfast centric, and all the clubs in the city have a news update, from the four top flight clubs to those in the lower leagues. 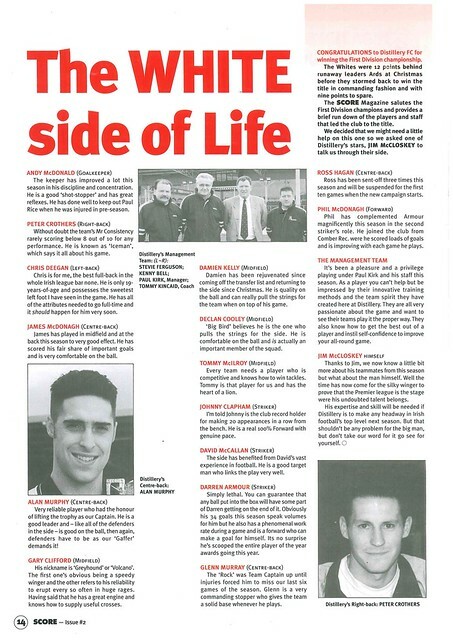 Joining the four Belfast clubs in the top flight for 1999-2000 will be Distillery, soon to be renamed Lisburn Distillery, and Jim McCloskey gives the lowdown on his team-mates. 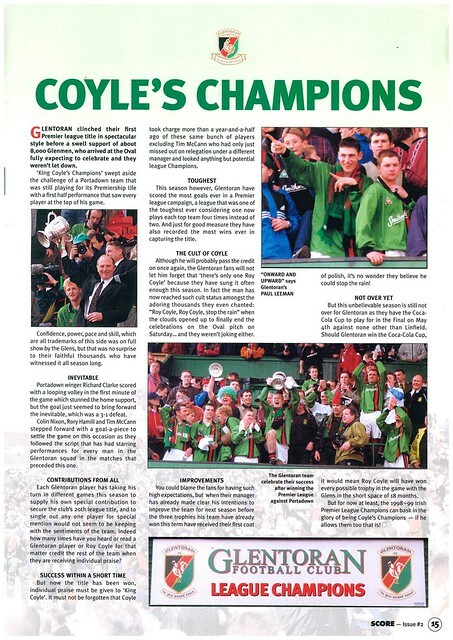 Glentoran won the league title in 1999, and the celebrations get a full page profile. The back page focuses on the national side with fans being urged to get behind manager Lawrie McMenemy, at the halfway point of Euro 2000 Qualifiers.